Portable oxygen concentrators or POCs are becoming more efficient, more compact, more portable and more affordable all the time. What once was an oxygen system that provided you with enough battery life and oxygen to quickly run to the grocery store is becoming a more viable solution for all types of oxygen dependent patients. With recent advances in technology and battery life, some portable concentrators are now able to help certain patients spend more time with their families and friends, enjoy longer outings around town, and even travel across the country. Depending on your oxygen needs, a portable systems is probably not a single supplemental oxygen solution, but as technology continues to improve, these compact oxygen systems are becoming more popular among oxygen dependent patients. With all the options available, we're often asked how to pick the right portable oxygen concentrator. This depends mostly on your oxygen requirements, but it's important to have an understanding of the different types of portable units available and the oxygen output you can expect from the machine you choose. There are two types of portable oxygen concentrators available on the market today: Continuous flow oxygen concentrators and pulse dose, or intermittent flow, oxygen concentrators. These two types of oxygen systems have very different benefits and limitations and each is best suited for a specific type of patient. Understanding each machine's capabilities will help you to determine which portable concentrator is the best solution for you. Oxygen concentrators, whether they are portable or stationary, take air from the room around you and convert it into a concentrated source of oxygen. The air we breathe is mostly composed of nitrogen and has only about 21% oxygen. An oxygen concentrator takes the air from the room and converts it into concentrations of up to 95% pure oxygen. This increase in oxygen percentages available through a supplemental oxygen system increases the oxygen saturation in your blood. Several years ago, the most common type of oxygen concentrator was a stationary oxygen concentrator. These large machines take up a significant amount of space in a room and limit mobility around your home. However, stationary oxygen concentrators typically deliver 1 to 6 liters per minute of oxygen continuously, making them a great solution for oxygen dependent patients who don't want to worry about tank refills. Portable oxygen concentrators operate just like stationary oxygen concentrators, but, because they are much smaller than stationary concentrators, have more limited oxygen delivery capabilities. Most portable concentrators available are pulse dose oxygen concentrators only, but there are a few continuous flow oxygen concentrators available on the market that can deliver up to 3 liters per minute of concentrated oxygen on continuous flow. The most comparable portable oxygen concentrator to a stationary oxygen concentrator is a continuous flow portable oxygen concentrator. There are currently only four types of continuous flow units available on the market. These portable units are able to produce up to 3 liters per minute of oxygen delivered continuously. Continuous flow units are a more suitable option for the majority of oxygen dependent patients than pulse dose, or intermittent flow, portable oxygen machines which we will discuss below. Because they are able to deliver up to the equivalent of 3,000 mL of oxygen per minute, this type of unit can handle a wider range of oxygen demands than a pulse dose model. As a general rule of thumb, if you require anywhere from 2 to 5 liters per minute of oxygen, a continuous flow portable oxygen concentrator is probably the best choice for you. In order for the continuous flow concentrators to meet a wider range of oxygen demands, these machines are generally bigger than other units on the market. The typical weight of one of a continuous flow unit is up to 18 pounds not including additional accessories. These are often just heavy enough that they require the use of a cart to transport your oxygen supply. While a continuous flow machine is indeed portable, it is less portable than many of the pulse dose varieties available on the market today. * The SimplyGo has (2) pulse modes. Pulse mode and night mode. Shown volumes are for pulse mode. Night mode has minute volume delivery. ** The SeQual Eclipse also had pulse settings of 128, 160 and 192mL, but has additional restrictions for use. *** Approximate continuous flow volumes at 2 LPM and 4 LPM are provided for comparison to maximum delivered by selected POC. 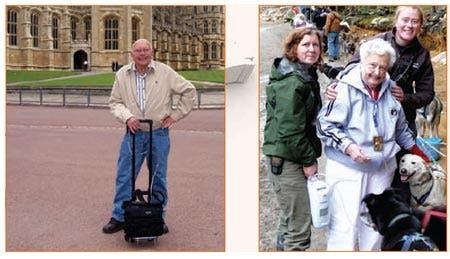 Pulse dose portable oxygen concentrators deliver oxygen intermittently. These types of machines deliver oxygen in pulses when the patient inhales, rather than continuously. Most pulse dose units are able to deliver anywhere from 450 mL per minute to 1250 mL per minute of oxygen in short pulses. Pulse dose portable oxygen concentrators are typically recommended for low oxygen requirement patients who require up to 2 LPM of oxygen. TPulse dose machines most often run on AC, DC and battery power. One thing to keep in mind is that battery life is often advertised for use at the lowest setting, so before purchasing, consider how much battery life you'll have when used at the oxygen output setting you require. What the pulse dose portable oxygen concentrator gives up in range of oxygen delivery compared to a continuous flow device, it gains in portability. These units are truly portable, with some of the newest pulse dose concentrators weighing as little as four pounds. Because of their small physical size and low weight, pulse dose systems are easily wearable and often come with shoulder straps or a backpack for ease of portability. We've covered the differences in functionality and portability between continuous flow and pulse dose portable concentrator, so now it's time to decide which, if any, portable oxygen concentrator is right for you. Begin by making a note of your oxygen needs for your daily activities and include your needs for sleep and rest as well. It's possible that a portable oxygen concentrator is not a single solution for your oxygen needs, you might be able to use a portable unit while you are away from home, but might need a more robust oxygen solution for use at home. For example, many portable oxygen concentrators are not approved, or recommended by doctors, for use during sleep. Talk to your doctor about the right solution or solutions for your needs. Once you know your daily oxygen requirements, you should have a pretty good idea of whether a continuous flow or pulse dose portable oxygen concentrator is the right choice for you. Now it's time to decide on a model based on what will give you the best range of oxygen delivery for your lifestyle. Consider the amount of oxygen delivered per minute first. Continuous flow oxygen is unique in that it delivers the same amount of oxygen regardless of your breath rate. So if you require 3 liters per minute of oxygen, that amount of oxygen is delivered to you throughout one minute whether you take 20 breaths each minute or 10. Continuous flow oxygen concentrators deliver a set amount of oxygen per minute when set to the corresponding setting. Pulse dose oxygen concentrators, on the other hand, have unique setting levels that deliver different amounts of oxygen per minute and and each manufacturer's setting delivers a different amount. So, it's very important to have a good idea of what your oxygen requirements are so that you can look at each model available to see what will work best for you. Also, consider buying a unit that can grow with your oxygen needs in the future. If your lung condition will require more supplemental oxygen over time, you might consider a concentrator that can deliver more oxygen than your current needs require. This might mean giving up a little bit in terms of the size and weight for a more robust pulse dose unit, or consider a continuous flow concentrator. There's a portable oxygen concentrator on the market for many lung conditions and oxygen requirements, and knowing your oxygen needs will help you determine the best choice for you. Keep in mind that many units aren't recommended for use during sleep, so you may require two oxygen systems: One for use at home, and one for use away. Finally, consider your future oxygen needs when making a decision. You'll want a concentrator that can grow with you as you require more oxygen or a even continuous flow setting. Regardless of the portable oxygen concentrator that you and your doctor decide is best for you, we're sure you'll love the increased mobility and freedom that a portable oxygen concentrator allows. How Do You Make an Educated Decision? First, while portable concentrators might be advertised as the only oxygen equipment you will ever need, this is not yet true. Concentrators are still a relatively new product and, as with any type of technology, are subject to occasional operational issues rendering the device unusable. It is recommended to always have a backup oxygen delivery system available, such as a stationary concentrator or liquid portable. Also, many clinicians and respiratory therapists are not yet comfortable with approving units for use during sleep. Because your breathing patterns typically become shallower during sleep, there is concern that operating on intermittent flow settings will not properly trigger oxygen delivery. While several manufacturers maintain their products are safe for nocturnal use and promote the ability to change the device sensitivity, many do not recommend using during sleep without approval from your doctor first. Second, know your oxygen requirements. Write down your oxygen needs for rest, activity (like walking, completing daily errands, etc.) and sleep, and share these with your doctor, respiratory therapist, and/or oxygen specialist, who can (hopefully) direct you to a product that can meet these needs. In an ideal situation, your concetrator of choice should be able to provide sufficient oxygen quantities while you are at rest, active, sleeping and/or at higher altitudes. Make certain that the concentrator you purchase can adequately provide you with enough oxygen to keep your blood oxygen saturation levels in an acceptable range. In order to do this, and in consultation with your medical professional, you should ask for a demo or test drive”. If “road testing” proves difficult through one provider, find a provider who will let you try out the equipment. Third, you must understand that not all machines are created equal. Intermittent flow units are more portable than continuous flow units, but they also have a smaller range of patient oxygen requirements that they are able to meet. Additionally, Intermittent flow (and continuous flow set to operate in their “pulse flow” modes) deliver their oxygen in different quantities.When you use a stationary concentrator; you know for a fact that a 2 LPM setting is 2 LPM of oxygen flow. Far more often than not, a portable machine set to “2” pulse flow does not mean 2 LPM or equivalent continuous flow oxygen. For example: When you are on continuous flow oxygen, the volume of oxygen you inhale is dependent on your breath rate. At 2 LPM continuous flow and breathing at 10 BPM, you may get about 67 mL of oxygen per breath, at 20 BPM you will get about 33 mL per breath and at 30 BPM you will get about 16 mL per breath. However, when set to a pulse flow setting of “2”, the AirSep FreeStyle delivers 18 mL of oxygen per breath, the Inova Labs LifeChoice delivers 25 mL per breath, and the DeVilbiss iGo delivers 33 mL per breath – three different machines, three different volumes delivered at the same numerical setting. On top of that, while the iGo may deliver the same volume per breath as 2 LPM continuous flow at 20 BPM, this only occurs at 20 BPM, and we all know we do not breathe at the same rate all of the time. So you can see why it is very important that you know what kind of oxygen volumes a portable concentrator is capable of producing. All manufacturers provide delivery specifications in their product literature, but these are not always comprehensive. If the concentrator delivers volumes lower than what you need to maintain oxygen saturations during continuous flow, then that unit likely will not be able to meet your oxygen needs. One other factor to consider is not just how you can use today, but how you will be use in the future. If your lung conditions will deteriorate over time, requiring more supplemental oxygen, you will want to purchase a portable oxygen concentrator that can meet these future requirements as well – do not limit yourself to unit that will only be useful as long as your lung condition does not change. Answering the question “What Portable Oxygen Concentrator should I buy?” is difficult, in part because the question is very specific to the person who is asking it. There is no right answer I or anyone else can provide you without knowing your specific situation and needs. I can say that while no unit is “better” than another, one may be a better option for you than another. With this article I hope to have given you some insight into what to be considering when asking yourself the question of what concentrator is right for you. To further help you understand some of the differences between the currently available concentrators, see the chart outlining some specific characteristics and specifications. All information was taken from product literature and other manufacturer-provided information and should not be considered comprehensive. This content was initially written by Ryan Diesem for the Pulmonary Paper for the May/June 2011 issue and used with permission of The Pulmonary Paper. Ryan works for Valley Inspired Products, and that VIP has no affiliations with AMSR. They can be contacted at 1-800-950-3698.